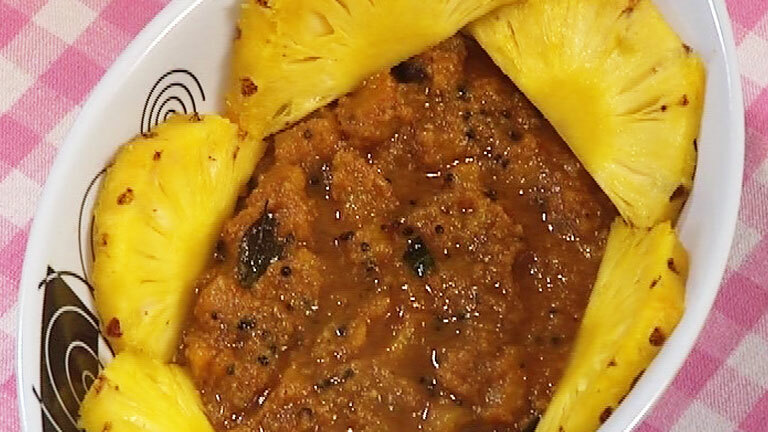 Cook pineapple with water, salt, turmeric powder, chili powder and big chilies. When it is properly cooked add sugar (water should completely reduce). Grind coconut, mustard seeds, shallots and curry leaves well. Add this mixture to the cooked pineapple. Let the pineapple cook in this mixture. Let it cool. Add curd to it. Splutter mustard seeds in oil. Add dried red chilies and curry leaves. Add this to the pachadi.